A concise review of the concepts and techniques applicable to emulsions and dispersions useful to industrial chemists and chemical engineers. Describes a wide range of topics under the headings of particulates, interfaces, stability of dispersions, and dispersed-phase systems. Also covers recently-developed computer-based methods which offer fast, precise measurements, e.g. particle-size distributions by quasielastic light scattering, dilational surface elasticity from the damping of ripples, and foam stability by the automatic recording of small pressure differences. 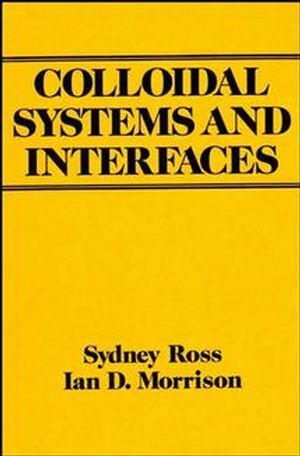 Sydney Ross and Ian D. Morrison are the authors of Colloidal Systems and Interfaces, published by Wiley. Processing Methods for Making Emulsions and Suspensions. The Relation of Capillarity to Phase Diagrams. Physical Properties of Insoluble Monolayers. Aqueous Solutions of Surface-active Solutes. Surface Activity in Nonaqueous Media. Thermodynamics of Adsorption from Solution. Appendix D: Electrostatic and Induction Contributions to Intermolecular Potential Energy. Appendix E: Electric Properties of Representative Molecules. Appendix F: Lifetimes of Contributing to Colloid and Interface Science. Appendix J: Manufacturers of Instruments. Appendix K: Manufacturers of Processing Equipment.